This Excel template is designed to document completion of activities in a checklist. HR departments in companies can use this to track or document new employee on-boarding activities. Typically, there is a list of activities that each employee has to complete to ‘on-board’ to the new company. We can use this one file to track such on-boarding for all employees. 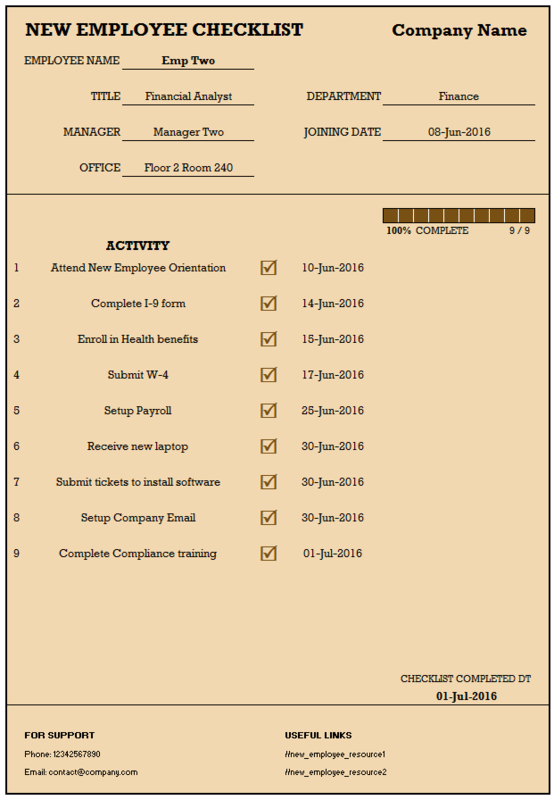 The template has three sheets – Settings, Employees and Print. It uses Excel tables feature to store information. If you are new to Excel Tables, please see article (with video) on Excel tables. In the Settings sheet, let’s enter company name. If we don’t want to print activity dates, then choose No to that. Finally, enter the list of activities. In the Employees sheet, let us enter each employee and their information. Tip: If you would prefer to print empty checklists and check items in the hard copy, then skip entering the Employee Data and directly move to Print step below. These fields can be renamed as needed. Then, we enter the activity completion dates for each employee, as they complete the activities. Please do not rename these date fields, as they will impact the formulas used. In the Print sheet, we can print the certificate for each employee separately by choosing the employee name. If you need to change the format of any of the cells (for example date to text or text to date), just select the cell and press Ctrl+1 to open the format cell dialog box. There is no need to change the Activities section of the certificate. At the end of the activities section, a Checklist Completed Dt will appear if the employee has completed all activities. We can customize the footer area by providing contact information for your business and any internal links for reference for new employees. There are no formulas here. We can just type directly. If you prefer to not have anything, you can select the cells, right click and clear contents. Now that you have the certificate customized, we can print (Press Ctrl+P to print) or export to PDF using Excel’s built-in options. The following are a couple of sample certificates printed. Hi there! I am editing this to include some tasks that need completing rather than on-boarding employees, as this template seemed to better fit my needs rather than a few of the other templates I reviewed. However, I am having trouble with getting the fields to display on the Print tab, & I’m sure it has something to do with the formulas. Any ideas on how to help? Thank you for creating something like this to aid in managing tasks better!! This template is fairly simple, the issue could arise in case a formula has been edited by mistake. You download a fresh copy and see if it works. Else, email the file to contact@indzara.com. Thank you sir,would you like to send me this format to my mail.